Our so-called lawn is now a meadow of flowers. Covered with white and blue violets, bugleweed, white and blue ajuga, moscari, and star flowers, dotted with bright yellow dandelions and a few forget-me-nots in damp places, and strewn with the fallen petals of crab apple trees, it is a burst of color simply too pretty to mow. Obviously, by not controlling it, we’ll be making matters worse in a town of manicured green plots. No herbicides or pesticides here, thank you very much. Which means that it’s ours for the eating, if we dare. 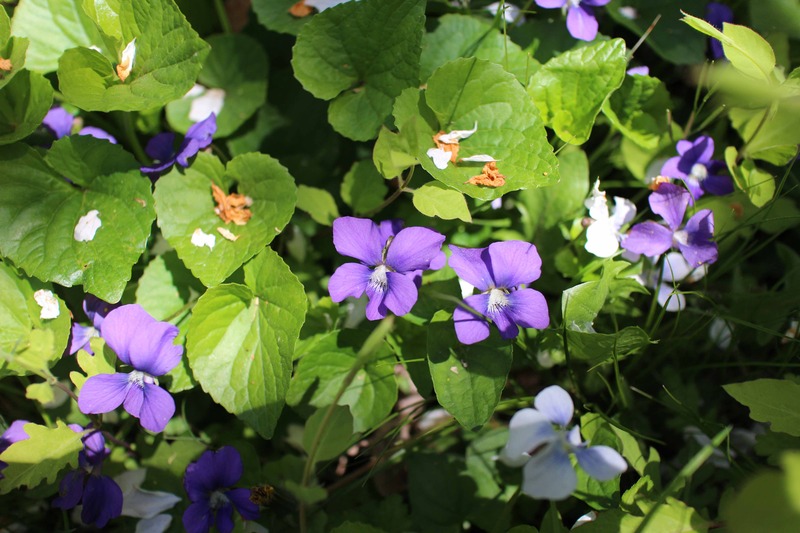 Violets – the flowers and the tender leaves – are not only edible, but are nutritious. While we don’t make a feast of them, they garnish salads at this time of year. I make candied violets for Mother’s Day cakes, violet vinegar and the prettiest violet jelly you’ll ever see. This year, I also made violet syrup. It’s basically simple syrup with floral overtones that we stir into seltzer, or make into a cordial – non-alcoholic with a tinge of ginger syrup leftover from my Christmas adventures – or a refreshing spritzer with a splash of light white wine. 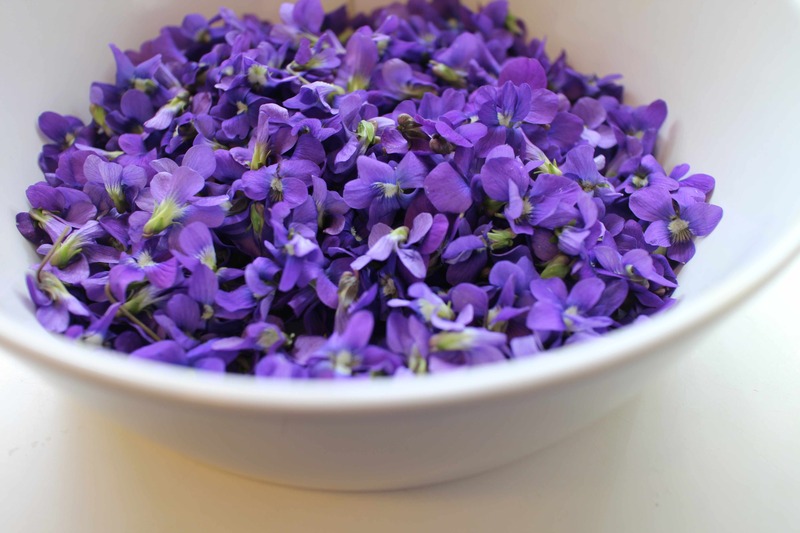 The trick with violets is to pick them in late morning, after the dew has dried and before it gets too hot. They’re most aromatic then, though some have little aroma at all until you concentrate them. I remove the petals from the green bract to get the purest color. 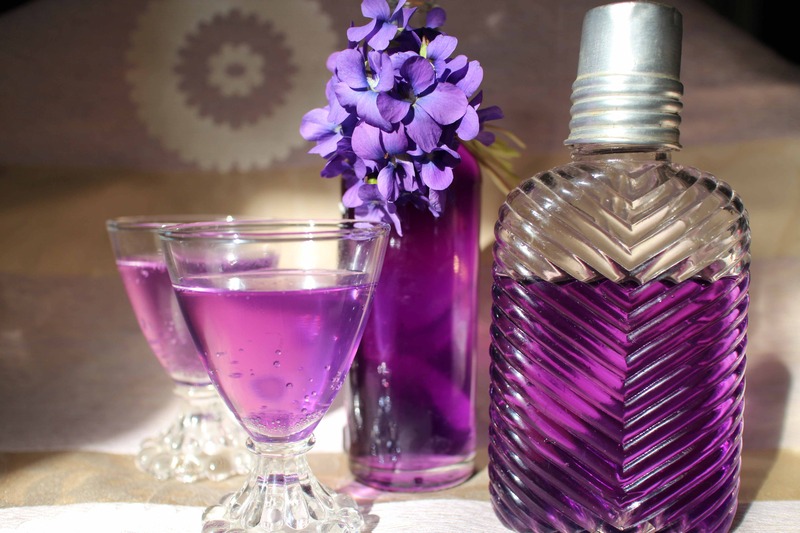 The color tends to be gray at first, but then turns bright violet when a small amount of lemon juice is added. For long-term storage, you could add citric acid as a preservative, which would have the same color reaction as lemon. Pick violets in late morning after the dew has dried. Remove petals from green bracts. Measure them. (I had 1½ c of petals.) 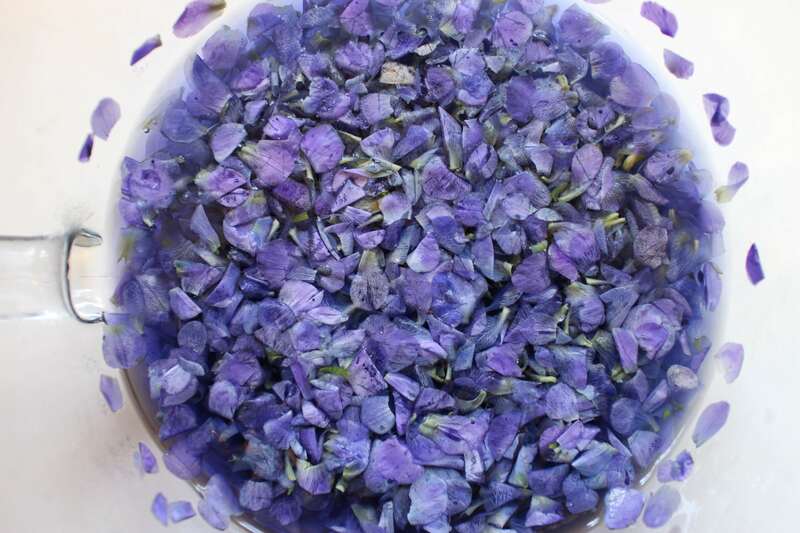 Cover the petals with an equal amount of boiling water and set them aside for 4-6 hours or overnight. Drain the liquid, measure it and place it in a saucepan (1 had just under 1½ c.) Add an equal amount of sugar to the liquid and being it to a boil, stirring to dissolve the sugar. Let it simmer for a few minutes to produce syrup. Add a tsp lemon juice per cup of liquid. The color will change from gray to violet. Cool and store in the refrigerator in an airtight container. such a beautiful color…must be a delight t drink it…!